When sound escapes the confines of a building, it takes on an unusual caste. At myriad outdoor festivals around the country, we’re in denial about this oddness as we amplify outdoor sound, add reverb and otherwise try to fake the effect of boxing it up in bricks and mortar. But for forty glorious minutes on Saturday 22 June, we heard sound in the open, in the wild – music that played the sky. I was one of thousands of people who heard about the strangeness afoot on a cliff top in South Shields, England, last weekend. And by Thursday morning, despite a near-empty wallet, I knew I couldn’t resist the call to down tools and journey north to the scene of the Foghorn Requiem. For the foghorn is one of those most evocative of sounds, one that never fails to instil a sense of excited, anxious alertness. I live in Brighton, a seaside town on the south coast of England where we still have a foghorn in operation. When I hear its notes dissipating through the fret that sometimes descends on our city, I’m sure I’m not the only landlubber who pulls the duvet around me just a little more tightly, imagining ‘those in peril on the sea’. 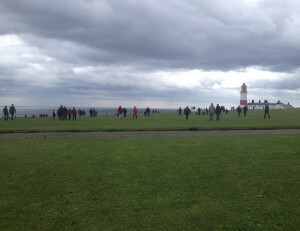 An hour before the Foghorn Requiem was scheduled, the cliffs around Souter Lighthouse were already teeming with curious people. Seekers of all ages were there with picnics, microphones, dogs and pushchairs, sporting pullovers, sun hats and anoraks as they tried to second-guess the British weather. The sky was blue but flecked with steel-grey clouds which created an inky band of sea on the horizon. Hundreds of us had congregated on the cliff edge around the lighthouse but few of entirely knew what would be happening. 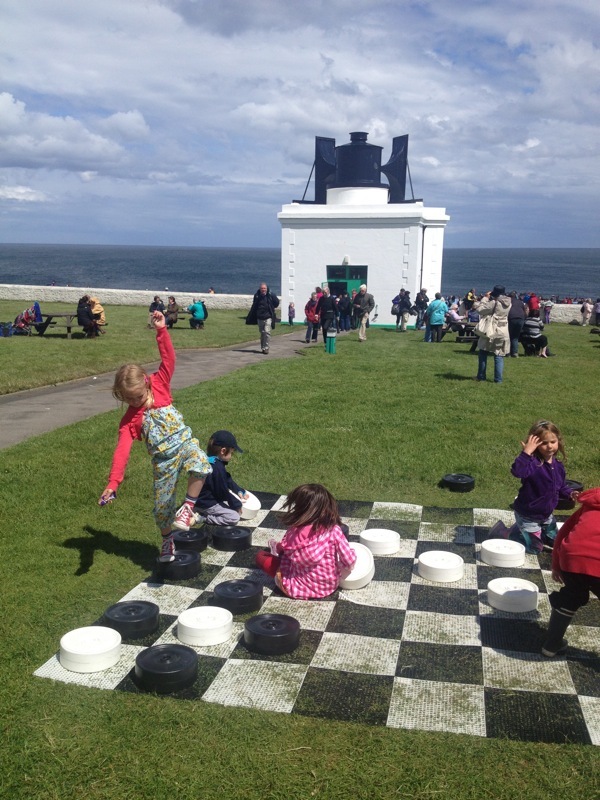 We’d heard partial descriptions: Brass bands would be playing, accompanying horns from the ships that were amassing on the coastline and the calls of the Souter Foghorn. At 12:30 in the afternoon, the piece began. Perched on this North Sea cliff just twelves miles east of Newcastle, the Souter Foghorn had been calling out to mariners since 1871. It was fitted with a pair of electrically controlled pneumatic horns in the early 1950s. On foggy days, these blasted a loud, steady bass F out to sea, warning ships to steer clear of the rocks below. When air was pumped from the foghorn’s reservoir tank into the twin horns, they wailed loudly enough to be heard 18 miles away, reaching ships far out at sea and sometimes penetrating the noisy streets of Newcastle. But in 1988, the Souter Foghorn was retired from active service, graduating from maritime sentinel to industrial relic two years later when it was given to the National Trust. Around the country, pneumatic foghorns are being decommissioned, usurped by GPS and radar which silently and accurately usher ships away from danger. We may be the last people to know the thrill of hearing a pneumatic horn calling out to sea. 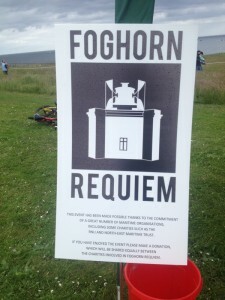 And this, I understand, was the reason for the Foghorn Requiem, a performance dreamt up by Danish artist Lise Augotena and her British associate Joshua Portway. The duo noted the passing of the foghorn into the history books and wanted to give it a proper send-off. So they worked with composer Orlando Gough on a cliff-top requiem, featuring Souter’s own foghorn which would call across the coastline, as though it was playing one last time. The Foghorn Requiem was an astounding performance, with many standout moments which I’ve been replaying in my head since Saturday. There was the solo cornet’s elegiac prelude, played from the walkway at the top of the lighthouse. And the eerie, long tone clusters of the brass band which evoked the sound of ships’ horns. Many of the North East’s finest brass players were stationed on the cliff edge, between the foghorn and the sea. We heard musicians from Felling, NASUWT Riverside and Westoe Bands. Just like the foghorn, they played acoustically, with no electrical amplification. On the cliff edge, their sound was fragile, disrupted by the sea breeze and the chattering and applause of the excited, gathered crowd. But it was one that rewarded careful listening. In some exquisite musical passages, we heard what seemed to be a co-ordinated call and response between the brass players and the ships’ horns far out from the coast. Hearing chords that were conjured from multiple vessels at sea was an unforgettable spatial sound experience. So was the mighty foghorn itself – the sounds from its two horns interfered with one another to create a palpable low-frequency beat which varied as you moved your head in its soundfield. But for me, the most sublime passage was in the closing two minutes, when the assembled brass players promenaded, while playing a chord, and lined themselves up along the cliff edge. They turned their backs on the assembled listeners and continued performing, playing out to sea. The edge of a cliff is an exotic acoustic environment: three-quarters of a perfect anechoic space. And the effect of notes played over the cliff edge was chilling. The extreme deadness of the acoustic should have suggested vastness – a sense of a room with no boundaries – but it felt curiously weak, humbling. Perhaps this was because we’re unaccustomed to hearing sounds without reflections from walls and ceiling. There was something of the siren about the musicians in this closing ritual. Witnessing it, you could understand why brass instruments were once used to designate the supernatural. The effect sensitised me to the few echoes we could hear, for instance the flutter that seemed to ricochet off the lighthouse cottage behind us. 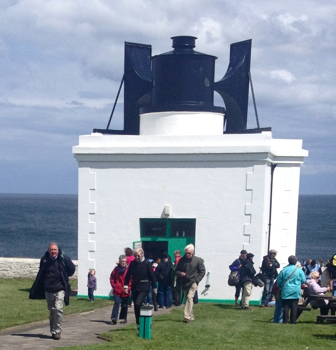 These beautiful seaward closing chords were followed by something unforgettable: the sound of the Souter Foghorn playing one last note, stoked by all three of its air feeders, and holding that note until it had exhausted its reservoir of air. As the reservoir emptied and its air pressure dropped, the note glissandoed downwards, faltered, cracked, then fell silent. This final gesture was animalistic, melancholic, like the last cry of a wounded beast. In the era of laptop music and electronic sound, it can sometimes be hard to instil a sense of theatre in contemporary music performance. There is, of course, a growing cult of anti-performance, where music makers relish the disembodied nature of their new works, performing them with few physical devices and minimal human gesture. We all know the stereotype of the electronic artist who presents his or her finest studio album by hunching over a laptop and a sampler. Anti-performance sometimes leaves the audience entirely unacknowledged. This is, of course, a perfectly valid way to present music – but one that’s left me troubled over the last few years (possibly because I’m an electronic composer with roots in the English folk scene). Performance is a matter of personal taste but my own litmus test for a contemporary music event is this question: ‘Why are we here, sharing this experience, rather than simply listening to these sounds at home?’ In my mind, the best gigs answer this question with the greatest clarity – and the Foghorn Requiem answered it in abundance. On the cliff top in Souter, I felt those collective emotions that can only emerge because hundreds were sharing the space with the brass players, the foghorn, the ships, the cliff, the sea and one another. Roboticist Rodney Brooks once claimed ‘the real world is its own best model’ and on Saturday afternoon, you could see what he meant. Hundreds felt the beats that can only be generated when air is pushed at high pressure through two adjacent horns. It was as though the pages of an acoustics textbook had magically become physical, visceral. It would be almost impossible to mimic the spatial effects we heard on the cliff, such as the sounds that played across great volumes of free air, to and from the sea. For this was situated, site responsive music – something that was all too clear a few moments before the performance when a gust of wind swept a page of a player’s score off his music stand and down to the sea. And it was undoubtedly a performance – that is, after all, the function of a foghorn. Arguably, with no audience, the foghorn has little purpose. As I looked around the audience, who seemed to come from many walks of life, I realised something else had happened when music had been liberated from four walls. We’d also lost the custodians of the music venues and contemporary music scene who usually mediate these events. In their efforts to establish a contemporary music tribe, I sometimes feel the gatekeepers can inadvertently box in music in another way. Almost as much as I loved the Foghorn Requiem itself, I delighted in the ethos of the event and people’s reactions in the moment. There was the toddler with a mobile phone, giving a blow-by-blow account of the warmup to her grandmother. There was elderly gentleman to my side who shook his head and muttered ‘I feel sorry for the skylarks’ after the first blast of the foghorn. And there were the ripples of laughter and applause that followed the first sounding of the foghorn, a heartfelt response to the shock and exhilaration of hearing such a powerful sound source at close quarters. Hours before I left for Souter, I was performing at Sound Day, an event about the nature of listening, devised by Sound Women Brighton. At that event, Kate Lacey spoke eloquently about passive versus active listening, warning us not to fall into the trap of assuming a binary distinction between the two. I was reminded of Kate’s words very sharply when I was in the crowd on the cliff edge. These people weren’t listening deferentially, nor were they listening quietly or exercising a desire to take control of the musical event. But they were busy listening. I couldn’t help noticing the contrast between the Foghorn Requiem and another performance that had also taken place in June, a hundred miles or so down the coast. Visitors to Aldeburgh Festival had been invited to pay upwards of £20 for the pleasure of sitting on the shingle and hearing Peter Grimes on the beach. The Foghorn Requiem was free – in many senses of the word – and this was one of its strengths. 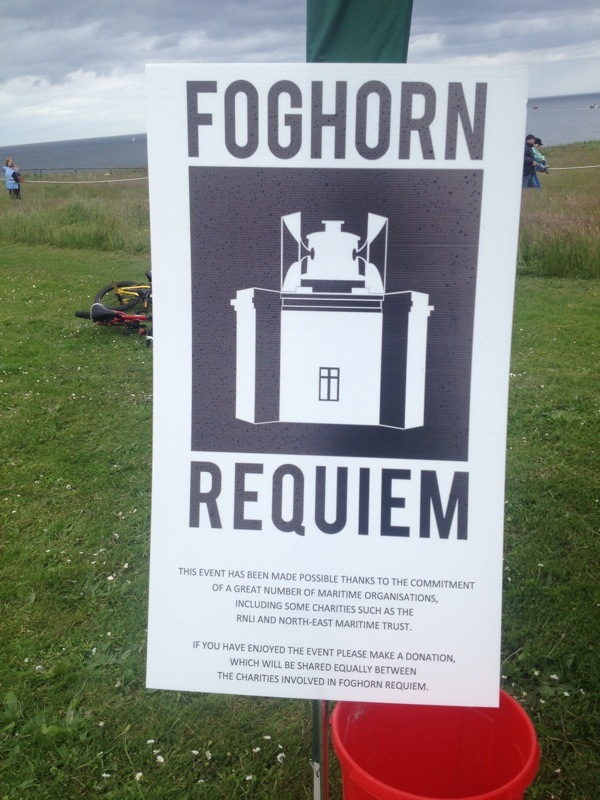 The musicians, technicians, artists and others behind Foghorn Requiem should be congratulated. As participative art it was exemplary. And as a piece of music it was sublime. For all the reasons I’ve given above about the nature of this performance, I don’t think my recording of the Foghorn Requiem does it justice. All the more so because I had to fashion a makeshift windshield on the cliff edge from some Elastoplast and a pair of tights (!). But I leave you with this snippet which includes the sound of the brass band playing out to sea and that unforgettable, plaintive final call from the Souter Foghorn. After the performance, I poked my head into the foghorn control room and marine engineer Ian Rutherford was kind enough to show me around. The original 1950s switch gear is still running. Here, you can see a stepper motor turning gears to rotate the coder disk once every sixty seconds. Notches on the edge of the coder turn relays on for four seconds then off for twenty six. These relays control the solenoid valves which release air into the foghorn. A tank holds a reservoir of air which can be driven through the horns at a pressure of 30psi (about the pressure of a car tyre). The 1950s switch gear that’s still running in the Souter Foghorn control room. There are some great photos from day on Sam Underwood’s site, including a particularly fine one where the Souter Lighthouse is reflected in the bell of one of the tubas (Sam is a musical hacker and tuba player). Sound artist and radio producer Robin the Fog has also posted some great sounds from the day (sans tights), including his report for the BBC World Service.